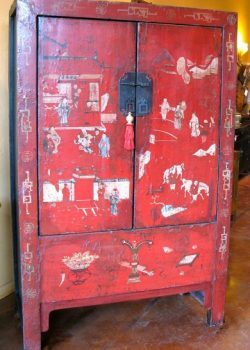 Large Chinese cabinets were one of the backbones of classical Qing Dynasty (1644-1911) home decor. Homes were spacious and usually accommodated an extended family as well as plentiful service staff so the furniture needed to be proportionally large. 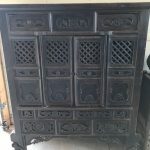 Hardwood cabinets with detailed carving and ornamentation would have been reserved for the master’s immediate family and other highly stationed relatives while plainer cabinets of more inferior woods were used to outfit the quarters of the balance of the household. Style, shape and joinery techniques varied by region and province. 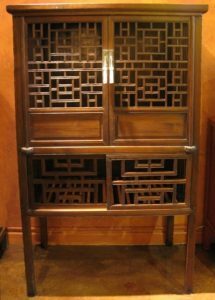 These regional differences coupled with woods used help us identify age and province of origin for most of these antique Chinese cabinets. We can no long ship large cabinets due to increase in motor freight costs. 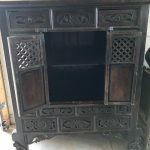 Large cabinets are warehouse pickup only. 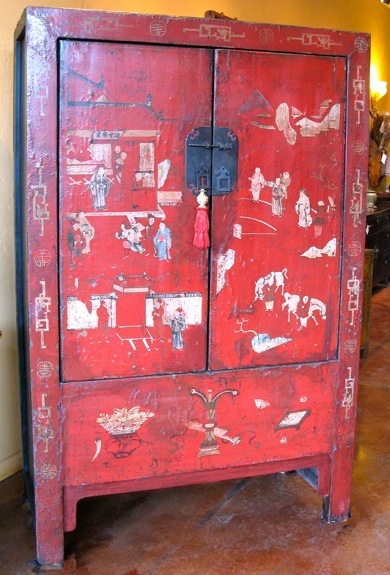 This Chinese antique red lacquer cabinet is one of our favorite pieces. 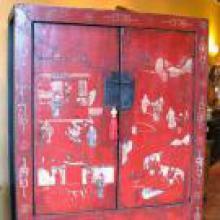 It is from early to mid 19th century Shanxi Chinese province and is in all original condition. Scholars and court officals adorn the lacquered doors. 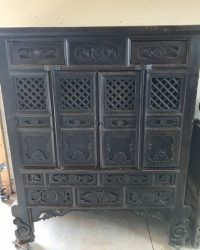 The quality construction and painting indicate this cabinet was the property of a wealthy family. Shipping Apprx. (info): $420.00. Call for an exact quote to your location. If you don’t see what you are looking for, please contact us. 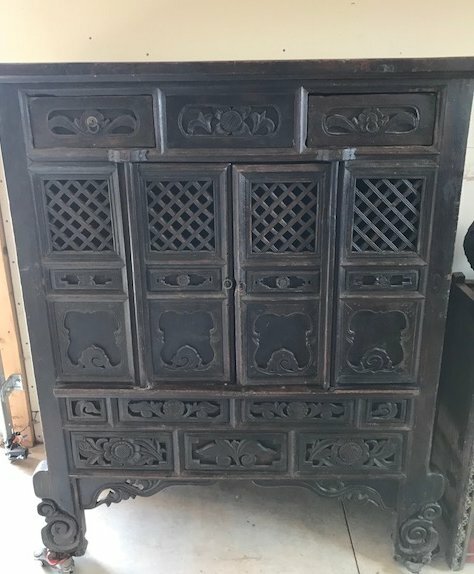 We have hundreds of pieces in our warehouse not shown on the website. Please remember that Asian Antiques is now open by appointment.